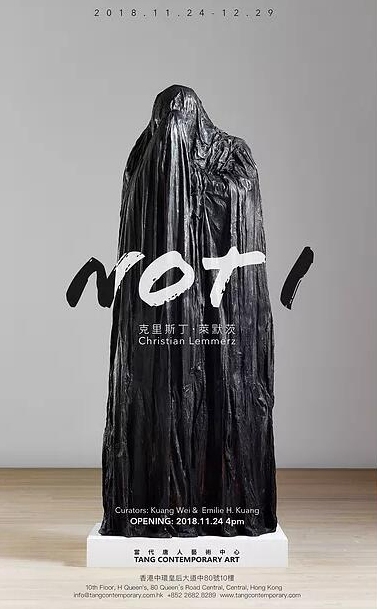 Tang Contemporary Art is pleased to present “Not I”, an exhibition by German-born sculptor Christian Lemmerz, marking the artist’s first solo presentation in Hong Kong. Over the years, Lemmerz worked with various medium, such as installation, film, interactive media, performance and drawing. He has created a large number of artworks that seem both fascinating and appalling to his audience. His works break taboos and often compose the essentials of human existence. ​The exhibition revolves around themes of life and death, will and oppression. Lemmerz possesses a combination of classical art with contemporary issues of our world. The artist has been influenced by great philosophers such as Immanuel Kant and Martin Heidegger, whose work he has been studying. He has also been influenced by our own time, where mass media, death, terror and suffering are central themes. One of the purposes of Lemmerz’s art is to create a space where the viewer’s own thoughts on identity, existence and being can have physical form. The striking beauty of his art stems from its shocking insistence and often leaves the viewer stunned and speechless. ​At first glance, Christian Lemmerz’s bronze sculpture Todesfigur is a human figure wrapped in cloth from head to toe. The cloth is draped around the body like the consuming plague eating and devouring the human figure. One cannot help but think of death in physical form. The sculpture will be featured in the exhibition at Tang Contemporary Art Hong Kong. ​Entering the virtual reality of Lemmerz’s La Apparizione, one encounters the Crucified One. A golden tortured body, released from the cross and floating in deep darkness, his wounds revealing flesh and blood behind the glistening metal surface of his skin. As a new medium and technology, virtual reality probes human consciousness, one of the last frontiers of neuroscience and philosophy. Taking place at this threshold of reality through the medium, Lemmerz’s depiction of Christ questions the very nature of existence, the feeling of being there, our sense of self. ​The exhibition will also include two series of drawings, Canto XIII and Snakes. Canto XIII pays tribute to Dante’s “Divine Comedy” and refers to the chapter that depicts gnarled trees in The Wood of the Suicides. Souls of sinners who killed themselves were transformed into these condemned and cursed trees that became part of the forest. Snakes is a graphic illustration of the VR work Traum and intends to portray a Freudian nightmare with snakes slithering into the space and creating feelings of entrapment and claustrophobia. Since the 1980s, when Lemmerz was part of the performance art group Værst (“Worst”) together with Michael Kvium, he has emerged as a master of classical art. Over the last couple of years, he has created work with traditional materials such as marble, paying tribute to Renaissance art. In 2009, he was awarded with the Thorvaldsen medal that is considered to be the highest distinction among Danish sculptors. Courtesy of the artist and Tang Contemporary Art, for further information please www.tangcontemporary.com.